Recently I found mention on the Bangor Urban Explorers' site of the possibility of an early subway system begun under the Portland streets but never completed. We don't have any information about Portland planning a subway and it's nothing we've heard about as hearsay. Every once in a while these tunnel questions come up -- tunnels in the Old Port and things like that. There is a tunnel running under Congress Street between the two Press Herald Buildings. Don't know of any others. So, the search continues. It would be a great thing to start a verified catalog of the tunnels, don't you think??? It is said that Robie-Andrews dormitory on the Gorham campus of the University of Southern Maine is haunted. The dorm is the oldest building on campus and in the 1800s was an girls school. I have heard two stories about deaths in the building. The first is that a girl committed suicide by hanging herself in the tower after she became pregnant and her boyfriend left her. The second story is that a young woman either jumped or was pushed to her death while a number of people were congregating outside the building. Students report hearing strange noises in the attic and finding cold spots in the building. Some report seeing a woman standing in the tower, even though the tower is sealed off and there is no way to get up there. The room next door to the attic is no longer used to house students due to the strange occurences that have taken place there. A student that works with me said that he had a friend who used to live in the room and when he visited her, the lights and tv would shut off by themselves. On Halloween, the resident advisors take students up into the attic to tell ghost stories...and they are never heard from again. Well, actually they all come out of the attic unscathed, but it just sounded much scarier to say they were never seen again. Today, class, we are going to discuss the Maine Ridge Monster. This variant on the Bigfoot legend is wildly inconsistent throughout its sightings, varying from an 18-inch furry person to a 6 to 8-foot tall furry person. Sometimes it has black fur, sometimes it has brown fur with a white chest patch. You never know what to expect with this big fuzzball of legend. Bearing that in mind, here is a selection of Maine sightings and related information for you to peruse. This site is run by Roger Thomas, who oddly enough doesn't even live in the U.S., let alone Maine. Nope, he lives in Wales, in the U.K. This has not prevented him from developing an enthusiasm for Bigfoot, and creating a bang-up site discussing whether he is fact or fiction. Very nice green, foresty aesthetic and well-organized. The "News" segments on the front page are very current. I found Roger's site when I was looking for mention of Maine and discovered this nice little chart that details some surprisingly early Maine sightings as published in a 1982 Bigfoot book. Who knew? These wooly bipeds were being witnessed in Maine as early as the 1800s! Sadly, recorded sightings detailed on the page have a 120-year gap between the early sightings and the 1970s when Bigfoot became "popular" again. Man, we humans are fickle. I wonder what happened to the tiny one that was captured in Waldoboro in the 1850s? Now that would be a good story. We can hardly discuss mythic simians without mentioning Maine's own cryptozoological creature, Loren Coleman. Back in 2001, he discovered an antique lettuce crate. Yes, oh my gods, a LETTUCE CRATE! Now you are scratching your head. Was the lettuce crate used to bring mass quantities of leafy greens to a captive Sasquatch? Did Bigfoot use it for cave furniture? Well, though these are likely histories for the crate, what Coleman did in fact find exciting was the crate's label, which featured -- you guessed it! -- a sasquatch! Yeah, yeah, yeah, you say -- big deal, some schmo developed a gimmick for his lackluster lettuce. No, no, no, Coleman could tell you, this is quite exciting. Why? Because, oh students of the strange, there is a 50+ year gap between Bigfoot sightings countrywide. From the early 1900s to 1958, the historic recording of sightings simply .... disappears. The "California Giant" lettuce crate, being from 1933, has given Coleman hope that there are sightings that occurred in this time frame, and has encouraged him in his search to fill that gap. To get a look at the label, which is admittedly quite cool, please see Coleman's own press release about the event and its ramifications. Last spring (2004), Drew, a fellow in Waldo, Maine, spotted a 4 to 5-foot tall black-furred anthropomorphic creature that he thinks might have been the Maine Ridge Monster. His account of the sighting is very brief but entertaining, and includes a graphic map of the encounter, and relates a delightful tale of school buses and his sasquatch startling a field full of donkeys. His humble and matter-of-fact acceptance of the fact that, with his luck, the sasquatch will turn out to be a squirrel in the end makes me want to meet the guy. Maybe I'll e-mail him for an interview. Back in 1974, again in the spring, another fellow had an encounter that was much more disturbing. This took place off Route 1 in York County, in an area known sometimes as the Barrens. A late night camping stop off the road, a terrible scream in the dark, and large bipedal footprints evident in the morning. Eeek!! A Sidney, Maine sighting of 16-inch footprints going into the Sidney Bog from January 2000 sounds promising, but the quick continuance of consecutive sightings all within the next week or so, including one in northeast Portland (?!! ), make one wonder if they were simply distorted human footsteps in the snow (snow is very deceptive when it comes to footprint sizes, as most of us snow-bound Mainers know). It's unclear whether these sightings, all within a few days of eachother, were observed by the same Bigfoot enthusiast. Another fellow ran into the Maine Ridge Monster in 1988 when he was out fishing with his father. The most interesting part of this story is the account of an old cabin they found, and the log of Maine Ridge Monster sightings that had been left there. While sounding a little fantastic, it's still pretty exciting to entertain the thought that everything happened as he said. Also of note is the mention of Maine Indians' legends of the creature, which bears some research in the future. More links to Maine sightings are found here, including one of the most recent one I've found yet, from 2004. There are some extremely clear footprint photos from the Frenchville area in 2000. Of particular note is a detailed historical account of Maine sightings that fills in a few more blanks in the chronology of the chart on Roger's site (see above). I would love to read the story of the man who shared a meat pie with Bigfoot, which I've found mention of in some of the posts. Well, all food for thought. It's good to flex the little grey cells before they start growing fur too. When I was a kid, we lived in Portland on Stevens Avenue near Morrills Corner. My brothers and I had regular exploratory routes in the odd spaces between things -- houses, Westbrook College, Evergreen Cemetery, the Armory. During the summer, especially, this was our stomping ground. One of the paths we would go down regularly ran between the back of Westbrook College and the huge lot behind the Armory. Back then, the Armory was very active, and the lot was filled with strange Army-green vehicles, including some that looked like they had actual missiles or some sort of rockets loaded on their backs. The lot was bounded by a tall chainlink fence, which had barbed and/or razor wire at the top. We were fascinated by the proximity of all this military equipment. It was like our G.I. Joe toys had grown up and would actually work if you sat in them. It was also fun to feel like we were spies, even though we had nothing and no one to spy for except for our own entertainment. I think we might have even taken photos of the missile trucks with our cruddy little 110 cameras. One day we traipsed down the trail as usual, probably on our way to the dirt access road that runs into either the older backside of Evergreen Cemetery or the soccer fields far in back of our house depending on which way you choose to go, and we noticed something new, strange, and disturbing. Around the perimeter of the fence, a shallow trench had been dug, maybe a foot or two wide and half a foot deep at best. Into the trench had been poured liquid tar. I could understand it as a deterrent to any fence hoppers. We ourselves were a little too wary of repercussions to climb the fence, but there must have been older, less concerned parties who happened upon the barrier from time to time and had no such compunctions, who tried their hands at jumping into Green Man's Land. So in that sense I guess I could reach for some logic as to the presence of the evil-looking tar spilled about in a long line. What my adolescent brain could NOT wrap itself around was the horrible carnage that ensued from this seemingly simple ploy. At regular intervals in the tar we came across the carcasses of dead birds. The stark horror of blackened feathered corpses and their curled feet still haunts my brain. I don't think we wandered down there much beyond that summer. Things were changing. Beyond the tar pits, Westbrook College had gotten a security guard that seemed a little more territorial than previously. Junior high was inflicting its societal "norms" on us. Social life was picking up for both me and my brother, two years behind me and formerly my constant companion. He spent more time adventuring with boys, both his friends and our middle brother, than with me, and I was babysitting, and started hanging out with my girlfriends more. High school and the mirage of adulthood loomed on the horizon, a vision soon to be disrupted by the roils of adolescent angst and parental restrictions. I didn't think of the refuge of the back ways again for many years. I kind of wish I had kept in touch with them -- it might have saved my sanity a little bit more than working a crappy job and moping about the house! Okay, this pretty much beats all. Back in its cultural heyday of the 1800s, Portland, Maine rivaled Boston as a metropolis of the north. Among other famous visitors you will find mention of Edgar Allan Poe's visit with his mother, a traveling actress, in one of his older biographies. Similarly, in Portland, Maine, he "occasioned a child 12 hours old, to exclaim apparently, that the town of Portland would be swallowed up by an earthquake in three days," leading "great numbers to depart from the city for several days." "Have you ever encountered a ghost? A spirit? A paranormal event? For a story he's writing, reporter Ray Routhier would like to hear from people who are convinced they've had such an experience. Please write a detailed, specific account of your experience and e-mail it to Ray. Please include your name, address and daytime phone number as well." Ray's e-mail can be found on the Press Herald's contact page at http://pressherald.mainetoday.com/readerservices/contactus.html by scrolling about 2/3 of the way down the page to the "Features" department section, or you can call him at (207) 791-6454. This is a great article about a family's experiences in their old Maine farmhouse. Lots of happenings, and several strong presences involved. Good account, with excellent historical photos of the persons thought to be haunting the property now. I especially like the man in the barn. These are old, and actually came from a non-local source, originally. I never found any substantiation for them, but still am weirded out by the fact that I found out about them from a completely random out-of-state stranger, and wish I knew who told her about them. When I was about 12 or 13, I started reading a new wave and pop magazine called Star Hits. Beyond the glossy photos of Duran Duran, Sigue Sigue Sputnik, and the Psychedelic Furs, they also offered a Pen Pal Page, where needy loners such as myself could write in and request letters from potential pen pals all over the country who spent their allowances on the same magazine. I wrote in and the response was a flood of over 100 letters from various points in the U.S. One letter was from a girl who wanted to know about a couple of paranormal hotspots she had heard about in Portland. Pure urban legend schmutz, but interesting anyhow! She wanted to know about a dark figure that was said to walk up and down in front of 41 Exchange Street, and about a body-shaped stain on the sidewalk in front of 10 Exchange Street. It's been a long time since I had the letter (I wish I had kept it! ), and I could easily have mixed up the addresses, or 41 Exchange could be 43 ... but you get the idea. I of course diligently peered about at the locales I was directed to, but my eventual response to the querent was sadly lukewarm, in the negative, and contained no new information for her, and I never heard from her again. Anyone else ever heard of these? For those of you unfamiliar with Portland's premiere weird spot, the store Strange Maine, here is an interview with Brendan done by USM's Free Press. Local plugs aside, I talked to Brendan the other day and he is excited about this blog and the potential for spreading and collecting information about the strangeness of Maine. Yippeee!!! I really see it as an extension of some of the work he is doing with the store in creating a venue and a meeting place for people with inquisitive minds and lots of curiosity. Brendan is pretty damn inspiring. Hopefully he will see fit to do a bit of writing for us here, and we are looking forward to posting his recent experiences on the road and his exploration of the legendary Connecticut ghost town, Dudleytown, in the spirit of propelling the strange into the New England area in general. Anyone with interesting weirdness to relate, especially about Portland, or Maine in general, is welcome to post here and/or e-mail me at msouliereSPAM@meca.edu (minus the SPAM portion, of course). Longtime rumors hold forth that there is a spot on the Kennebec River as it runs past Hallowell, Maine, where the bank has been seen to glow green at night. This spot is supposed to be the location of an early massacre, and sources say that there is a plaque commemorating this sober occurance at the spot. Sources also say that this local legend was an inspiration for Stephen King's "Tommyknockers" green glow. The next time I head up there I'll check it out myself, but if any of you know anything about this, rumor or otherwise, I would love to hear it. Those of you who have wetdreams about being chased through a cornfield by a machete-wielding maniac can make a nighttime visit to Dayton's Pumpkin Valley Farm cornfield maze the weekend of Oct. 28-29th and make your way through it by flashlight or moonlight. You'll have to bring your own maniac, but I'm sure that's half the fun. For info click here! "The 2005 Conference will be held at the Ramada Inn, Pleasant St., Lewiston, ME on Saturday, October 22, 2005 from 8am to 5pm - Investigation to follow. " Follow the link to make your reservation!!! An article about the Psychic Fair recently held on the reputedly haunted site of Maine's Fort Knox, including accounts from the Maine Paranormal Research Association about research done on site. PROSPECT - Friends of Fort Knox Director Leon Seymour isn't entirely sure if there are spirits haunting the historic war base, but he and his organization offered people the chance to find out for themselves July 2 and 3 when they hosted the First Paranormal/Psychic Fair.Seymour said the festivities were much like that of the wildly popular "Fright at the Fort," which the Friends host in October. This fair's attractions included a Tunnel of Terror, which weaves through the Fort, providing visitors with a scare or two from several spooky volunteers. Visitors could also get Tarot Card Readings, psychic readings and sit in on ghost hunting lectures as part of the festivities. Seymour stressed that the fair was "for entertainment purposes only" but his disclaimer may not have been heard by many in attendance. "There has to be something to it," said a woman from Lisbon as she waited for a reading. "There is just no way they could know that much about me without even knowing who I was." Seymour said that the two-day fair, which he expected to draw somewhere around 3,000 visitors, was a great way to attract guests who wouldn't normally visit the Fort.Earthly guests, that is. "There seemed to be a tremendous amount of interest in the paranormal and in psychics in the general community," said Seymour. "It provides us with a chance to attract another segment of the general population." Like Fright at the Fort, the paranormal fair was inspired by some strange happenings in various sections of the Officer's quarters. Seymour explained that a former Park Ranger once claimed to have seen a man dressed in a "Civil War era-type uniform." After first dismissing the vision as just a local re-enactor, the man said that when he was shown a picture of the former caretaker, Sgt. Leopold Heygi, the resemblance was undeniable. That account was also brought up by Sky Taylor of the I-95 radio station, who along with several others, once tried to stay overnight and document any eerie findings. "I could tell that we weren't wanted," said Taylor, who said she and others felt the sergeant's presence. "He is still the caretaker," said Taylor, also noting some bizarre electrical malfunctions that occurred with cameras and thermometers.But Fort Knox certainly isn't the only Maine site said to be occupied by spirits. Roxane Fryover, of Auburn, who works with the Maine Paranormal Research Association, was on hand at the fair and explained that Maine is "the perfect site for hauntings" because as she explains, spiritual energy is derived from the natural environment, such as trees, water, rocks, etc. Fryover was one of several representatives from the association, founded in 1998 out of Lewiston. She explained that the group primarily conducts investigations into alleged hauntings. "After the psychics do their readings we conduct interviews, and use temperature readings, night vision cameras and electromagnetic field readings," said Fryover. "Then we decide whether it is truly paranormal or man-made and the results are not always conclusive." Fryover said that over the years the group has encountered everything from simple hauntings to demonic activity. "We have heard EVP, electronic voice phenomenon," said Fryover. "Other instances - we have had a poltergeist who was knocking holes in the wall and we determined that that energy was coming from a young child." She said that in rare circumstances, demons are detected, but when this happens different specialists are called in. "We don't cleanse houses," said Fryover. "We don't tell them to move on, we identify them and sometimes they can communicate with our psychics. Sometimes they don't know they are dead. Sometimes when they find out they are dead they move on." The group is still trying to develop new tools to identify these spirits, but even with all the technology used to track them, they still will not be able to figure why things like this happen. "There's tons of theories out there," said Fryover. "We believe that people can come back and visit. Another reason why it happens is because of a sudden death or traumatic death. It happened so quickly, they don't know they are dead, so they just go on." Bill Washle, the organization's founding member, spoke to a group of listeners at a ghost-hunting lecture on Saturday and told perhaps the most frightening story he had ever encountered in his investigations. A woman in Western Maine had called him, with fear in her voice, saying she heard footsteps walking across her living room floor. Washle and his team of investigators arrived at her home and began to conduct their research. They took temperature readings, recorded for EVP and brought in psychics to help explain the mystery. After awhile, it became strikingly clear what was causing these creepy sounds. "It turned out to be the oil tank," said Washle. "Being extremely startled by an unexpected noise or sight is the main characteristic of the disorder with the peculiar name of Jumping Frenchmen of Maine. It's not just bolting when someone sneaks up behind you, explains Butcher. Patients with the disorder flail their arms, cry out and repeat words. First identified in some of Maine's lumberjacks of French-Canadian origin, the odd reflex has been identified in other parts of the world, too." Hmm... I wonder what scared them so much, hmm??? I bet there are some interesting stories from the dark of the Maine woods, which were echoing for the first time with men's axes and saws, plundered and enraged out of their aeons-long solitude. Of note is this interesting phenomenon: "In response to sudden sensory input, abnormal reaction occurred. For example, if one of them was abruptly asked to strike another, he would do so without hesitation, even if it was his mother and he had an ax in his hand." Affected persons were known commonly as "jumpers." It was Beard's studies (mentioned above, circa 1880) that encouraged Gilles de la Tourette to study similar behavior that led to his discovery of what is now known as Tourette's Syndrome. I can see I am not the only one with delicious dreams of writing short fiction about this intriguing weirdness. Drat! For those of you curious (as I am) about the haunted looking Ram Island Ledge lighthouse, House Island, and other curiosities of the Harbor and Casco Bay -- lucky us!!! WMPG took a tour of a bunch of these oddities and made recordings of their discoveries which you can download on their site. Maybe it's not strange. But maybe something is making its way up through the crust??? Ha ha ha... I remember being in Wells at a family friend's house for dinner when I was very young, around 8 or 10 years old, and there being an earthquake. Everything was vibrating heavily and plates were rattling, and it seemed we were doomed. It was dark out and very foggy, and my brother and I were convinced it was the dinosaurs coming to take over the earth. AYERS JUNCTION, Maine - A minor earthquake shook a small region in northern Maine, officials said. There were no reports of injuries or damage. The preliminary epicenter of the quake Saturday night was about three miles from Ayers Junction, said John Ebel, director of the Weston Observatory and a professor of geophysics at Boston College. The quake measured 3.4 on the Richter scale. A quake of 4.0 magnitude can do moderate damage. "That's too small to be damaging, although it was probably a good rumble and probably woke some people up near the epicenter," Ebel said. The quake likely was felt about 20 to 30 miles from the epicenter, Ebel said. aside from the obvious, the paranormal. I've heard theres lots of ghosts and legends up north. rightbehinders, sidehill winders, ghosts of all variety. also, right here in portland there are underground tunnels connecting the city. last night was the kind of night we used to roam around in. it was beautiful, and for me, definately is the first truly fall sky i've seen this year. I am being treated to a concert at the moment -- the wind is blowing past a vent(?) somewhere outside my office, and I have the pleasure of hearing it whistle and moan and sing up and down the sonic register like some strange windsong from another world, a siren warning of a break in the threshold. I haven't heard wind whistle and moan in a long time. It has made for a very happy morning. The blustery weather continues. This is like the neverending rain this spring -- a system is circling around and around the Gulf and seems determined not to give us much in the way of fall sun. The wind is stripping the leaves from the trees before most of them even have a chance to change. 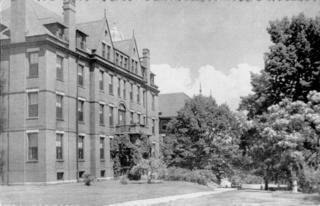 For those of you into urban exploration, here is an article about the mysteries of the steam tunnels that run under Bowdoin College in Brunswick, Maine, installed around the turn of the century. Particularly intriguing is the quote given from Louis C. Hatch: "Bowdoin has and probably will have for many years, a memorial of its strange unknown." ...!!! It just sets the imagination afire. While overtly bland and upper-middleclass to all appearances, Bowdoin also is home to many examples of Victorian and medieval revival architecture that make any redblooded fantasist hot for teacher. (did I just type that? Pardon me!) 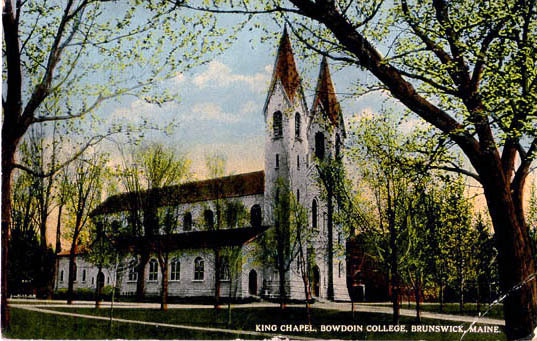 King's Chapel looks good and gothic in an old Maine Penny Postcard, and an overhead view of the college shows a good many spires. Add to this the recent installation of Loren Coleman's Cryptozoology Museum, and things start to get more interesting. To visit the museum contact Mr. Coleman at MuseumMail@lorencoleman.com . Good thing that ol' blogger account proves still active! One of my favorite stories by Lovecraft, and one which led to certain terrible associations with the strange barren woods of winter Maine, is The Thing on the Doorstep (conveniently available online at the link given here). After reading this in my late teens and rereading in my early twenties, late afternoon returns from the skislopes at Sunday River with my skibum ex became extremely creepy. The bare trees, the sun going down behind cold grey humps of granite hillside, and scattered ramshackle dwellings and sheds along the winding, icy route gave rise to deep feelings of foreboding and made me dread the rides home. I am a big fan of creepiness but sometimes it crosses the line of excitement and thrill and bleeds deep into DREAD and TERROR. Recent excursions into the Bridgton area in late fall had similar tones -- I think it has something to do with that specific time of day, the black trees, and the still, cold, standing water they are reflected in. For those of you familiar with Sarah Orne Jewett's work, or at least her name and reputation as a Maine-based writer, you may be interested to read up on her supernatural writing, and its relationship to H.P.Lovecraft and Stephen King. Me? I'm going to go look for the collection of Dunnet Landing stories mentioned. I'm starting this blog up to hopefully begin a record and network of Maine weirdness, and perhaps a bit of other New England weirdness as well. 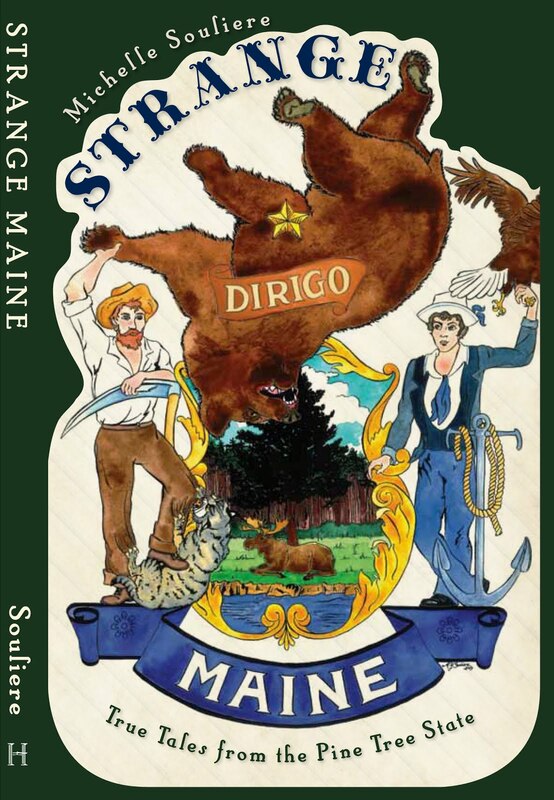 If you would like to post about Maine strangeness, please feel free to join in the discussion!! !